Big Band Library: Abe Lyman "California, Here I Come"
nephew William H. Simon, Jr.
His musical career began in 1911, playing drums at the Colonial Cafe in Chicago. He later played the drums in a nickelodeon (and admitted that he did this without pay, just to see the movies). In 1918, he moved to Los Angeles and played drums in a group at the Vernon Country Club, then formed his own band in 1920 to perform at Santa Monica's Sunset Inn, which was run by his brother Mike and frequented by movie stars. On April 1, 1922, Lyman and his band opened in the Cocoanut Grove of the Ambassador Hotel in Los Angeles - and an estimated 2,000 people showed up! Counting renewed engagements, Lyman stayed at the Grove for a record 5 years. "Mr. Lyman belonged to the golden age of Hollywood when La Brea Avenue was a muddy path in a forest of oil-well derricks, when movie directors sported leather puttees, wore their caps backward and shouted instructions to actors through megaphones while the cameras were being cranked by hand," it was once written. "It was the era of the big time and the talents of the movie stars were measured by the size of their stuccoed mansions, their Rolls-Royces, Mercedes Benzes and Daimlers. For recreation they went to the Cocoanut Grove in Los Angeles' Ambassador Hotel, and it was in this top spot that Mr. Lyman and his Californians made their mark." In the early 1930s, they appeared at Grauman's Chinese Theatre on Hollywood Blvd. in Los Angeles. For several other years during that decade, he then served as m.c. at the Hollywood Restaurant at Broadway and 47th St. in New York City. Lyman's hit records included Mary Lou, which he wrote [ in addition to I Cried for You and (What Can I Say, Dear) After I Say I'm Sorry ]; Little Old Lady; and Amen, which was sung by the Californians' band vocalist Rose Blane. His recording career had started in 1922, on the tiny Santa Monica-based Nordskog label. Between 1923 and 1936, he and his orchestra made hundreds of titles for Brunswick, accompanying singer Al Jolson on a popular 1924 disc, Mandalay. 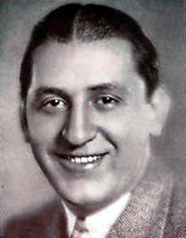 Lyman and his orchestra were later signed to Decca (1936-39), Bluebird (1939-42), Hit (1943), and Columbia (1944). Though he retired from music in 1949, Lyman remained active as a director and stockholder in the Mike Lyman Restaurant, operated with his brother, William. Upon his death in 1957, Lyman left property worth more than $250,000 to his wife and other relatives. Fellow bandleaders Ben Pollack and Phil Harris were among the attendees at his funeral service, where Rabbi Edgar F. Magnin commented, "To bring happiness, joy, music, laughter to people-this is a great thing." and on the Coast for Many Years," New York Times, Oct. 24, 1957, p.33. "Abe Lyman's Family Left $250,000," Los Angeles Times, Oct. 25, 1957, p.B2. "Band Leader Abe Lyman Dies at 59," Los Angeles Times, Oct. 24, 1957, p.B1. Ate van Delden, "Abe Lyman - The Early Years," VJM's Jazz and Blues Mart, pp.2-4. "Ex-Musician Abe Lyman Dies in Los Angeles: Chicago Native Noted for Hit Tunes,"
Chicago Daily Tribune, Oct. 24, 1957, p.C2. "Funeral Rites for Abe Lyman Draw Throng," Los Angeles Times, Oct. 26, 1957, p.B1. "Lyman, Abe," in ASCAP Biographical Dictionary, Fourth Edition (New York City: R.R. His life began in a modest way. To help his father support the family, he sold newspapers, drove a taxi, was a cigar store clerk, and a waiter. He went on to become a name bandleader, popular songwriter, and successful businessman. Lyman and his band, known as his "Californians," eventually toured the nation and Europe, in between vaudeville, radio, and movie dates.